Ask any computer DIY enthusiast of their views on compact computer casings and most would quip back that it is actually a taboo. Common reasons cited would be the lack of expansion, ventilation and usefulness with regards to upgrading. To most people of this group, medium-tower casings are an absolute minimum requirement for a PC setup. But what if you are really out of space to accomodate large and bulky casings? Mini towers might be an option but besides the marginally reduced height, most of the other dimensions remain similar. 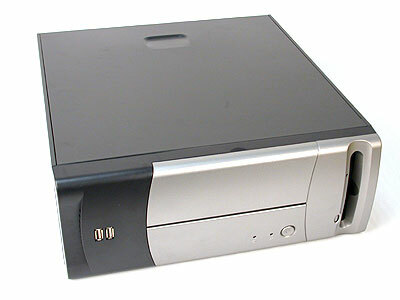 Only compact casings such as micro-ATX casings can offer much smaller dimensions. Of course, for this you will have to forego the use of standard ATX motherboards and settle for smaller micro-ATX versions. Although some micro-ATX casings are still big enough to secure a standard ATX mainboard, the Casetek Tiny Tower case is only a micro-ATX case. It is more or less lower than mini-tower casings in height, has a compact casing depth and is only as wide as 3.5-inch drives placed horizontally. It is also specified to support a Pentium 4 or Athlon XP based system. If properly installed with the right kind of hardware, these miniature systems can easily match a mid-tower system. The mighty Casetek Tiny Tower Casing ready for Pentium 4 or Athlon XP rigs! Its dimensions are 370 x 135 x 354mm (DxWxH) It can be left standing or laid down horizontally. 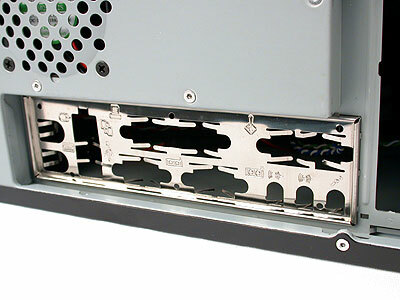 The ATX I/O shield shows that the casing allows the installation of any micro-ATX mainboards with the common double-decker ATX I/O deck. This makes selecting a mainboard an effortless task. 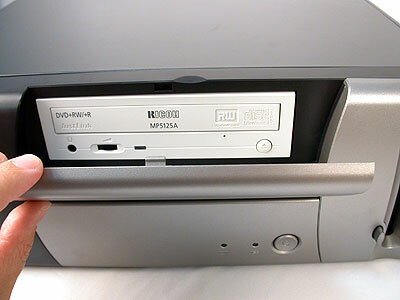 The casing looks better with a uniform colour thanks to the 5.25-inch bay door hiding the optical drive behind it. You would probably consider mounting a rewritable optical drive more than any other device given that there is only one bay.